Of all the places to study abroad, few countries offer the same breadth of experience and cultural horizons that India can impart to a young American. So if you need to know how to call the USA from India, keep reading because we can help! India is a vast land of great ethnic and topographical diversity. A trip to India, especially for a young student, will leave an indelible impression. So much to see and do, you’ll definitely feel the need to be calling U.S. from India. After all, what good is an amazing story unless you can share it with someone? Well, Vonage will be there the whole way, so you can call the U.S. from India without thinking twice about the cost or connections. When you sign up for our top plan, Vonage World®, we’ll assign you a new domestic U.S. phone number, which will be programmed to the Vonage Box™ that we’ll send you. With this box, you can call the USA from India to any cell or landline. Conversely, your loved ones can reach out to you…all for the same basic monthly payment! Just take the Vonage Box to India with you and plug it into a high-speed Internet connection. Then you’re all set and can start calling the USA from India whenever you want. Also, since you’ll be taking a U.S. phone number with you (via the Vonage Box), your friends and family will be reaching you at a low, domestic price. Even better, when you return to the U.S., your number doesn’t change. It’s international dialing made easy. Unlimited1 calling to landlines in over 60 countries — like the U.S. and India! Call any phone in America for free. For a limited time, call any phone in the U.S. from India (landlines or mobiles), Vonage or non-Vonage, absolutely free! In development. India is as famous for its beautiful scenery as it is for its emerging economy and enormous influence in the high-tech world. However, it is also recognized for its significantly high rate of poverty. You’ll find that overcrowding is prevalent in many cities, yes, even in the more prosperous. You should prepare yourself emotionally to encounter some visible misfortune on your travels. Hydration nation. Whether you’re in a monsoon- drenched or desert-covered area of India, you’ll need a ready supply of clean water that you can trust. It’s always a good idea to boil open-source water (for example, from a tap), but you can try bottled water as well, though you’ll be adding to the unnecessary plastic waste. Just make sure the seal is intact before drinking, and that the bottle doesn’t look as if it was previously crushed/overly dented. Water-purification tablets are an even easier option and much more cost effective. Rest well. A lot of U.S. travelers who spend excessive time overseas in hot, humid nations eventually experience something called tropical fatigue. Besides the weather/climate, the main causes are emotional and mental strain due to a lack of proper relaxation, heavy drinking and partying or over-exertion at work or study. So take it easy on yourself. 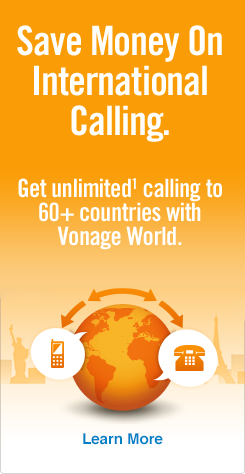 Calling from India to the USA can be a no-brainer with the help of Vonage Mobile and Vonage World!